Have you paid any attention to the new tariffs imposed on goods imported to the US? I’ll tell the truth: there is so much chaos in the political news all the time, I haven’t keyed in on this as much as I should. However, yesterday I saw two articles on the tariffs and the cost of quilting. The issue in total is worth understanding better, and if this is our entry into that understanding, so be it. The first item to clear up is the term “tariff.” A tariff is a tax or duty paid on a class of imported goods. (Alternately, it could be imposed on goods being exported, to be paid before they leave the country.) The importer pays the tariff. If the importer re-sells that good directly, they will need to increase the price at which they sell, in order to recoup the expense of the tariff. If they don’t increase the price, their profit will be reduced or wiped out. If the importer is a manufacturer, they may be able to cut costs elsewhere to reduce the impact of the tariff. However, that will have a different effect, perhaps on the other suppliers they buy from, or on labor, or on the end buyer of their goods. In July, the Trump administration announced that new tariffs would be imposed on the import of $34 billion of Chinese goods coming into the US. The intention was to make Chinese goods more expensive for American consumers, so we would import less Chinese product as compared to the amount of US product we export to China. In addition, American businesses would theoretically be “protected” from foreign competition, allowing them to increase their sales. A trade deficit is the amount by which a country’s imports exceed its exports. According to the US Census Bureau, at the end of June, the US had a trade deficit with China of $185.7 billion for the year to date. In other words, we imported $185.7 billion more from China than we exported to China so far in 2018. In 2017, it was more than $375 billion for the year as a whole. The hitch in this plan comes in with retaliation and escalation. As soon as the tariffs were announced, China declared their own set of tariffs on incoming American goods. And in return, trump has set in motion more tariffs against China, as well as new ones against Canada, Mexico, the European Union, and Japan. A wide range of goods from all over the world will be more expensive for Americans. So how does this all affect the quilting industry? After August 30, another $200 billion of Chinese goods will be subject to tariffs that could be from 10-25% of value. In 2017, the US imported $6 billion worth of fabric of all types. Not all of that was from China, but from what I can gather (a variety of somewhat confusing sources,) about 30% of woven cottons are from China. It is reasonable to assume that the prices we pay for fabric will go up, on average. Fabric companies will have to cover the tariffs as they import, and that cost will need to be covered by the consumer to maintain their profits. Small retailers (local quilt stores) may not be able to pass on the price increases to their own customers, which could lead to more shops leaving business. In addition, textile machinery, including sewing machines not made in America, may have increased prices. (Which “domestic” or regular sewing machines are actually made in America these days? Any?) Tariffs on goods coming from the European Union and Japan might hit that market. Parts for repair of your older machine could face the same hurdles. Many gadgets and notions are made in China and may have higher prices, too. I don’t have the answers on this, but I advise you to pay attention. Some retailers, including JoAnn Fabrics and Dharma Trading Co. have already notified customers that tariffs may affect pricing. Here are the two articles I saw yesterday. One is from craft industry expert and reporter, Abby Glassenberg. Mostly, it explains that she is researching the issue and will be reporting on it soon. Sign up for her newsletter for notification on this concern, as well as other great stuff on the craft world. The other item was from Quartz. It gives another brief summary of the upcoming changes. Update 2: As said below in comments, ‘My post is NOT about the politics of this, from either side. As I mentioned, there are economic arguments in both directions. And this is not a question or post about “is it worth it.” It is ONLY to let people know this is an issue they should be aware of. If there are more comments on the politics of it, I will delete them.’ I have very strong opinions on the politics of this. As a retired investment professional with degrees in finance and economics, and many years experience in the field, I also know a few things about the economics of it. I WILL NOT DEBATE those issues here, and I will not allow for others to do so, either. That, again, is NOT the point of the post. Thanks for your respect on this. Expect to see more on this soon. If enacted, these tariffs have the potential of affecting every part of the quilting industry. This entry was posted in Quilting, Quilting as a Business and tagged Economics, Tariffs, Textile business, textiles on August 23, 2018 by Melanie McNeil. Last month Jim and I traveled across northern Nebraska and through Wyoming to Yellowstone National Park. We’ve posted several times about our 3,000 mile road trip in our joint blog, Our View From Iowa. When we returned, we dropped south into Colorado before driving across southern Nebraska. For our route, the most convenient way to cross the Missouri River is on I-80 at Omaha. To get that far, we went through Lincoln, NE, home of the International Quilt Study Center & Museum. A few days before, Jim asked me if I wanted to stop at the museum on the way by. Well, YEAH! I visited the museum with my sister a few years ago and was glad for the opportunity to go back. The current exhibits included four small galleries, none of which drew my interest. 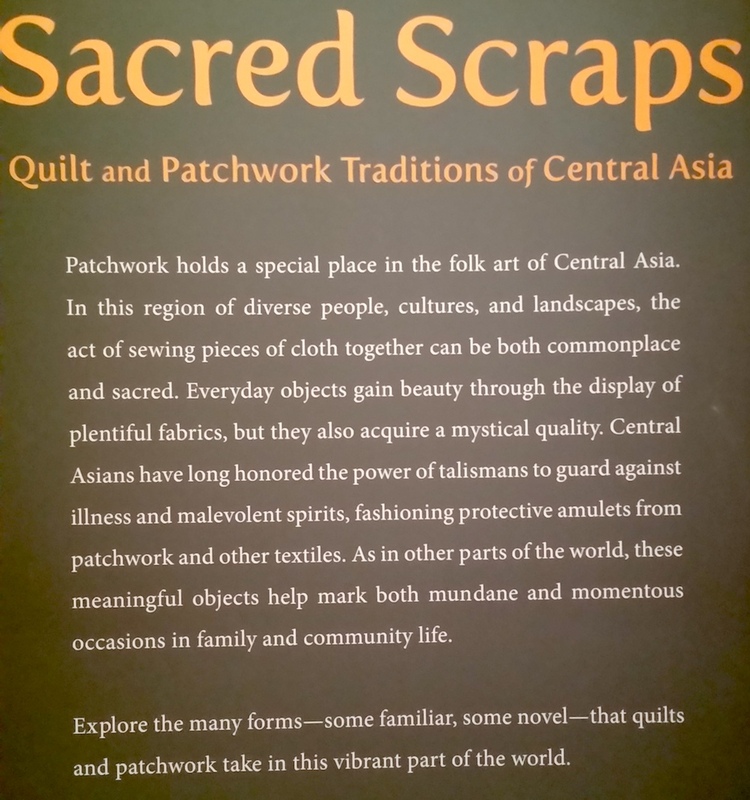 Besides the small exhibits, a large gallery displayed dozens of quilts and other textiles from Central Asia. It’s easy (for Americans!) 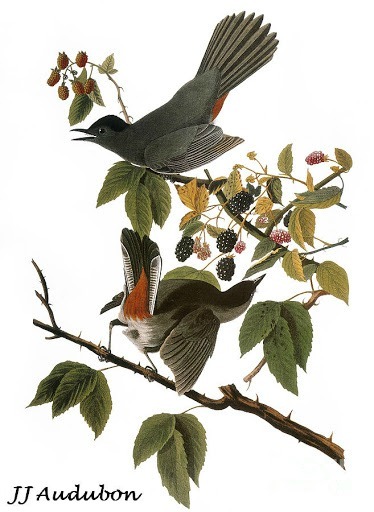 to believe that quilting has its origins in the US, and is primarily an American craft. But people quilt all over the world and have since early textile history. The quilts in this exhibit show the beauty of a quilting tradition with which we’re less familiar. The items on display played many functions. There were household objects, such as bedding and wall-hangings to decorate the interior of yurts. Some clothing for children had triangle motifs to bestow protection from danger. And horse “blankets” would dress up the plainest horse. Here are just a few of the many objects. Click on any picture to open BIG in a new tab. 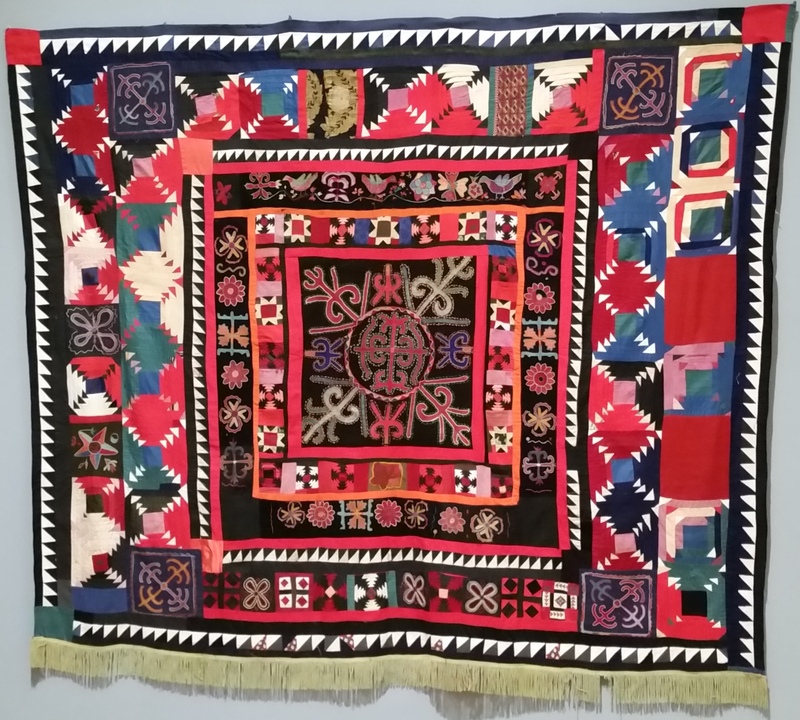 Patchwork and embroidered wall hanging from southern Kyrgyzstan, mid-20th century. Note the combination of pineapple and other blocks in the outer borders. Also see how the HST are a little unpredictable. We missed the label on this one. See the asymmetry with the extra border on left side. Also the placement of blocks is asymmetrical. Some of the blocks are unpieced ikat. 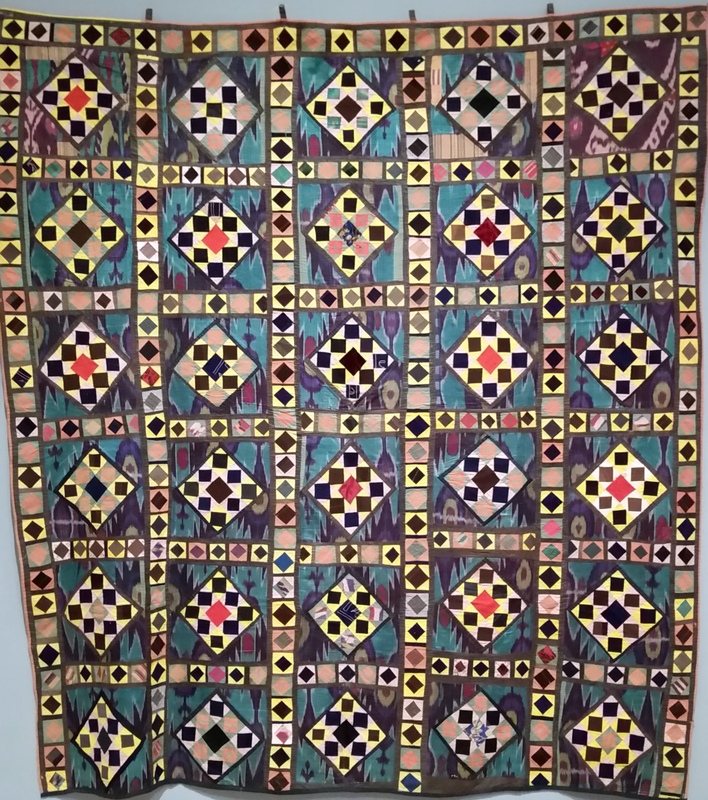 Patchwork hanging from Uzbekistan, mid-20th century. The tiniest flying geese I’ve ever seen. See how the corner blocks differ on all these miniature pieces of the bigger quilt. Patchwork hanging from Uzbekistan, mid-20th century. So intricate! And note the background setting triangles for each of the blocks. Have you ever been so bold? 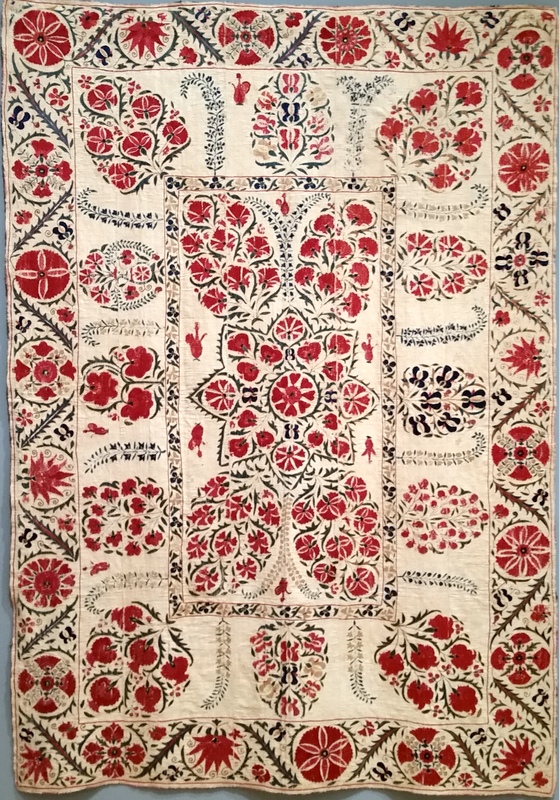 Embroidered quilt, Uzbekistan, late 19th-century. 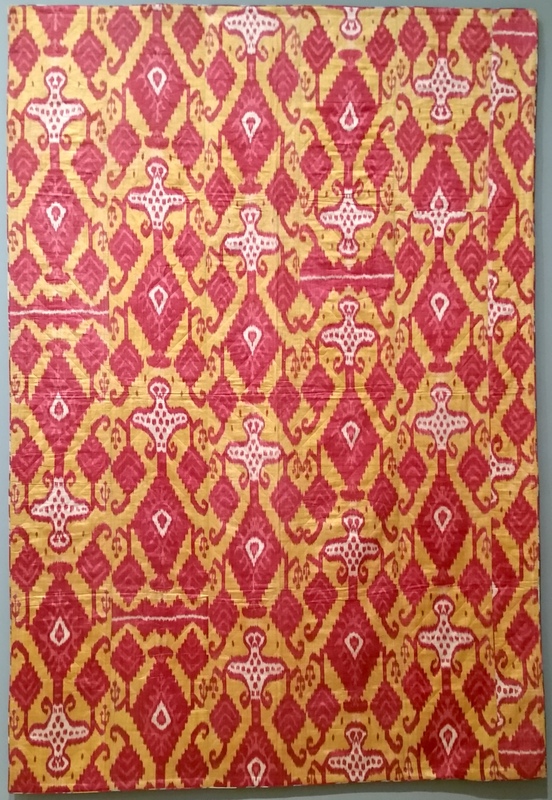 This reminds me of Indian coverlets from the 1700s. I could have spent a lot more time looking at these beautiful pieces. But the road called and we headed home. 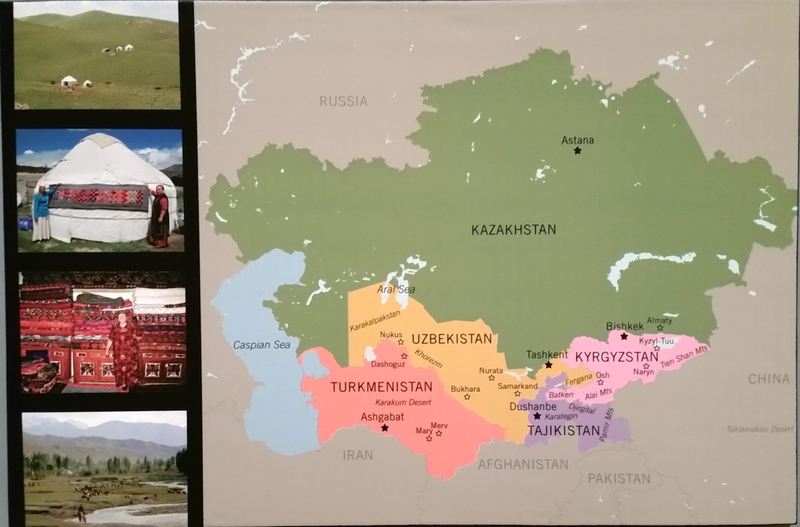 This entry was posted in Quilting, Quilting history and tagged Central Asia textiles, International Quilt Study Center & Museum, IQSCM, Quilt museums, textiles on July 7, 2017 by Melanie McNeil. Cathie’s “Fantasy of the Squirrels” on the left. My “Garden Party” on the right. Click on the picture to open it larger in a new tab. One of the things I love about quilting is how two quilters can interpret a pattern or an idea completely differently. 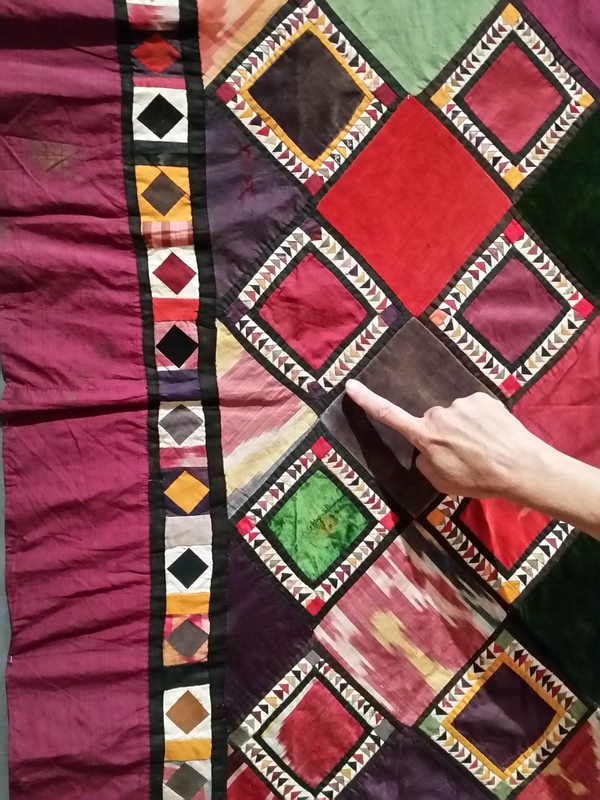 The photo above shows two quilts made using the center panel designed by Julie Paschkis. My sister Cathie made the one on the left side of the picture. I made the one on the right. Frankly, I think they are both terrific. 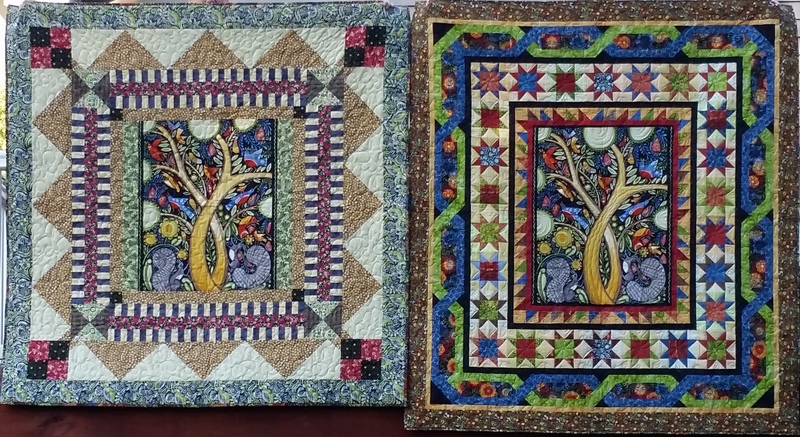 If you click on the picture, you’ll see the details of both quilts better. With hers, I love the way the split-striped border creates movement with the light/dark bars’ contrasts. Those contrasts are offset by the soft brown on either side. The triangle points extend the center outward, giving it even more presence. The outside border is a leaf print of blues, greens, and black swirling through, continuing the “fantasy” of the center, and playing well with the green and black print that squares the center. She repeats both the reds and blacks from the center with the corner four-patches, adding to the unity of the design. In mine the colors are more saturated, the value contrasts stronger. This is a typical difference of how she and I work. I enjoyed seeing the finished quilts side by side. 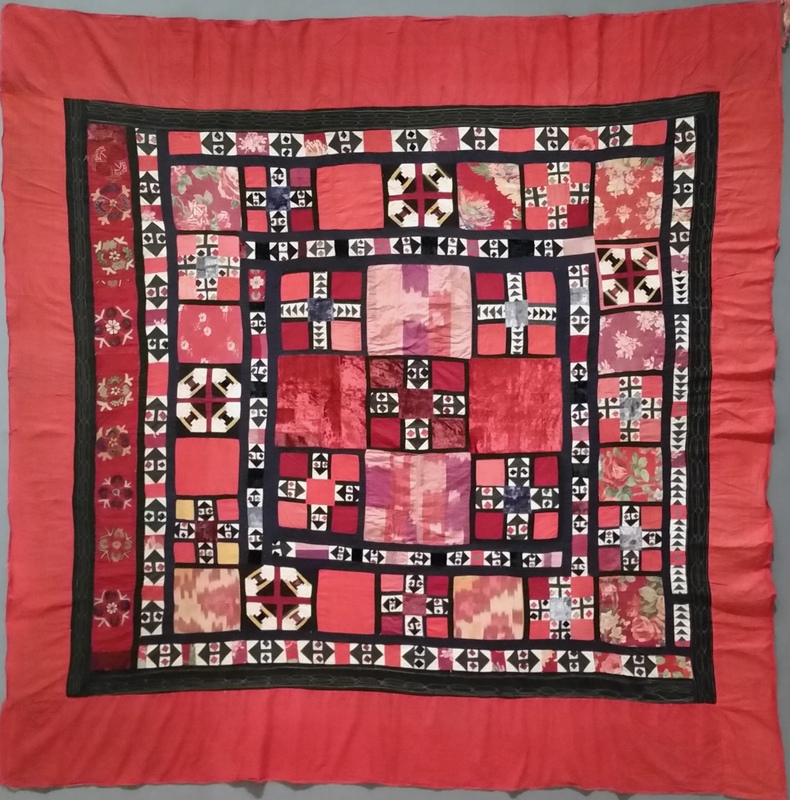 This entry was posted in Creativity, Medallion Quilts, Quilting and tagged Center block, family, Fun, Julie Paschkis, Medallion quilts, Original design, sisters, textiles on October 3, 2015 by Melanie McNeil. Last time I showed you batik production. Today I thought you might be interested in printed cotton production. It is a largely automated process, rather than with such intensive manual labor like batiks. There are two videos below. The first one is from Robert Kaufman and lasts less than 10 minutes. It gives an overview of the printing process. It includes recognition of design and the interaction of the U.S. offices with printing factories in Japan and Korea. There is no narration but there are a few captions and some pleasant music. The second one is almost 19 minutes long, and includes narrated detail about the factory process. Fabric preparation (after weaving), printing, and finishing are included. If you have time, I think this one is more informative. If you have a half hour, you may enjoy both. Cotton — Where Does Your Fabric Come From? Cotton — What Happens After Harvest? This entry was posted in Quilting, Quilting as a Business and tagged Cotton fabric, Cotton fabric printing, Fabric factory, Factory tour, Quilting fabric, textiles on April 4, 2015 by Melanie McNeil. Do you use batiks in your quilts? Their beautifully illuminated colors and organic designs work well for many quilt patterns. The firm, smooth texture makes applique easy with little fraying. Their potential for bleeding in the wash scares me a bit, though, and I don’t use them a lot. But they do work well in some projects. When I use them, I mix them with solids, traditional florals and geometrics, and more contemporary prints. For me, batiks are just one more way to obtain the colors I want. Below are two different videos. One is a short video by Hoffman showcasing the creation of batiks in Bali. The other is about Moda batiks and takes about 17 minutes. I do not know if it is officially a Moda video. It shows the process in Indonesia. Neither video includes narration, so if you don’t like the music, you can mute the sound. Both videos show how incredibly labor intensive batiks are, with multiple hand applications of dyes and resists. If you have time, you may find both very interesting. I won’t make any claims about the safety of conditions for workers, but it did give me pause. This entry was posted in Quilting, Quilting as a Business and tagged Batik production, Batiks, Cotton fabric, Fabric factory, Factory tour, Quilting fabric, textiles on April 3, 2015 by Melanie McNeil.